Rep. Steve Scalise was among the people shot Wednesday morning. Rep. Steve Scalise underwent surgery today, his third procedure since suffering severe injuries Wednesday when a gunman opened fire on Republicans practicing for a congressional baseball game, sources told ABC News. 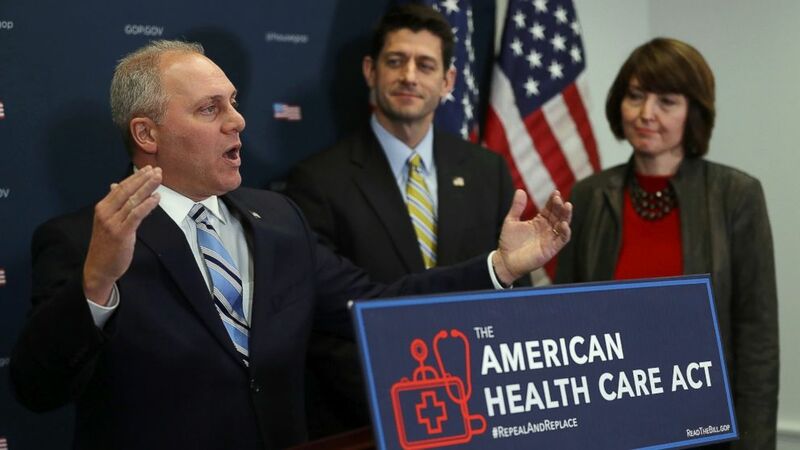 The House majority whip and Louisiana Republican was rushed to a Washington trauma center Wednesday with fractured bones and internal organ damage, according to hospital officials, and remains in critical condition. 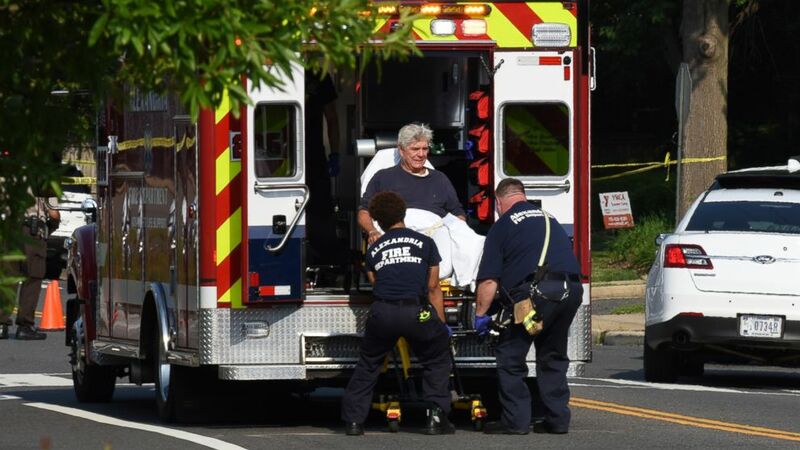 Three others, including a Capitol Police officer, were also shot Wednesday morning at Eugene Simpson Stadium Park in Alexandria, Virginia. The gunman was shot and killed at the scene after police returned fire. (Shawn Thew/EPA) People gather near the scene of a shooting at the Republican Congressional baseball team practice in Alexandria, Va, June 14, 2017. At least 21 members of Congress were at the Wednesday morning baseball practice, including Scalise and two U.S. senators. Staffers and family members were also there. Rep. Joe Barton, R-Texas, said his 10-year-old son was there when the shooting broke out. Barton was emotional at a news conference Wednesday, saying his son had "25 dads" because everyone looked out for him when the gunfire began. Sen. Rand Paul, R-Ky., said he was in the batting cage when he heard an isolated gunshot. Then "a burst of gunfire" erupted, Paul told ABC News. "At that point, people were dropping. Scalise was shot around second base and he crawled a little bit into the outfield." 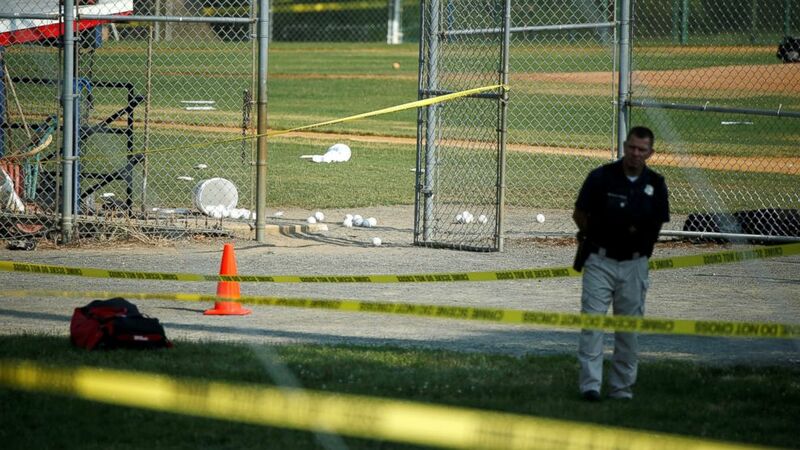 (Joshua Roberts/Reuters) A police officer at the scene of a shooting where a gunman opened fire on members of Congress during a baseball practice in Alexandria, Va., near Washington, D.C., June 14, 2017. Rep. Brad Wenstrup, R-Ohio, a medical doctor and Iraq War veteran, told Fox News he administered aid to Scalise after the shooting stopped, putting a compression on his wound. "I felt I was back in Iraq but without my weapon," he said. Wenstrup said Scalise "was as brave as he could possibly be. He said, 'I'm thirsty.' Obviously, you don't know how much fluid he may be losing internally." Scalise is in critical condition after he and three others were shot as lawmakers practiced for the annual charity congressional baseball game set to take place today. (Justin Sullivan/Getty Images, file) House Majority Whip Steve Scalise speaks during a news conference at the U.S. Capitol on March 15, 2017 in Washington, D.C. He is suffering from a rifle shot to the left hip and severe blood loss, according to MedStar Washington Hospital Center, which said Wednesday night that he required "immediate surgery" and multiple units of blood for a transfusion. Scalise went into surgery again this morning at MedStar Washington Hospital Center, sources told ABC News. A source close to Scalise told ABC News this evening that he is out of surgery and remains in critical condition. Tyson Foods lobbyist Matt Mika, a former college baseball and football player who works for Tyson Foods and was helping with practice when he was shot, was upgraded from critical to serious condition, his family said today. 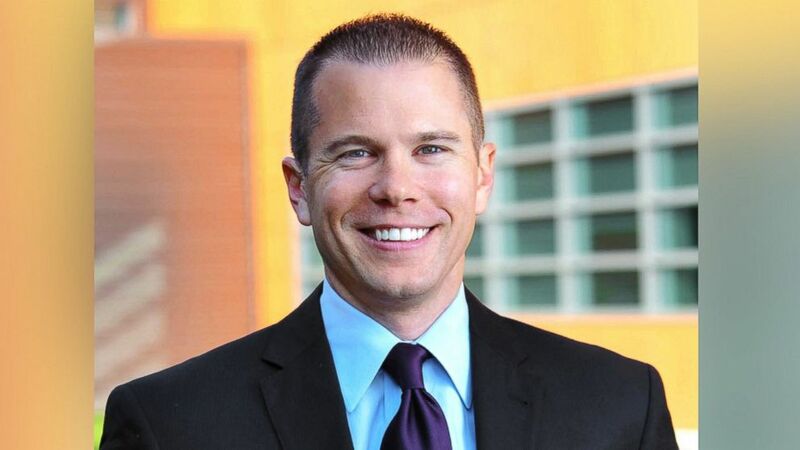 (Tyson Foods) Matt Mika, who works as a lobbyist for Tyson Foods, was shot June 14, 2017, in Alexandria, Va., when a gunman opened fire on a baseball field where congressmen where gathered. His family said earlier, "Matt was shot multiple times in his chest and arm and suffered massive trauma." "He requires assistance to breathe and will need additional surgeries. Matt has been alert, conscious and communicating through notes." Mika's family said in a statement Wednesday, "While the attack today was a terrible surprise, Matt’s presence on the ball field, helping longtime colleagues and friends was not." 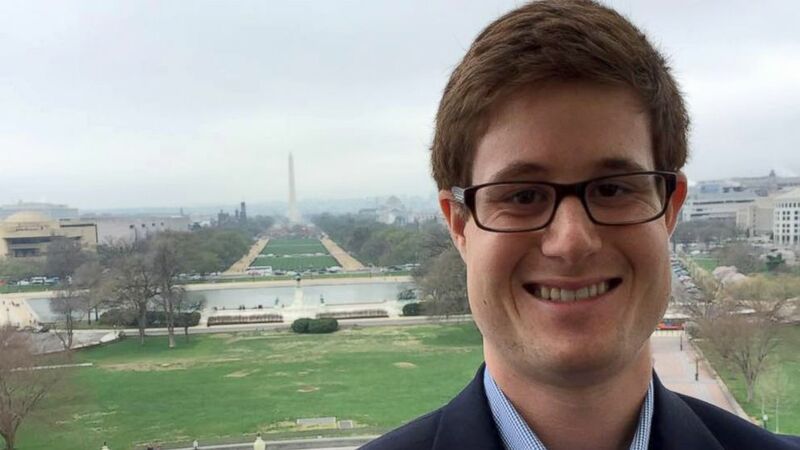 Zack Barth, a legislative correspondent working for Texas Rep. Roger Williams who was helping them prepare for the game, was also shot; he has since been treated and released from the hospital. Barth's family spokesperson said a bullet went through his calf and, after he was shot, he saw the gunman aiming at him. Barth then dove for the dugout, where he grabbed a belt to wrap around his leg to stem the blood flow, the family spokesperson said. Sen. Jeff Flake, R-Ariz., also helped Barth, Williams said. (Zack Barth/Facebook) Zack Barth seen in the undated Facebook photo. Williams, who is the team's coach and injured his leg and ankle diving to safety in the dugout, told reporters this afternoon that even though Barth was bleeding, he continued texting from the dugout, letting people know they needed help. Crystal Griner, the Capitol officer, was shot in the ankle, U.S. Capitol Police Chief Matthew Verderosa said. The hospital said today Griner is in good condition. Additionally, two individuals -- Rep. Roger Williams, R-Texas, and a Capitol Police officer -- sustained minor secondary injuries. Williams was emotional at a news conference this afternoon, saying the Capitol police officers prevented what "could have easily been 25 deaths or more." (Kevin S. Vineys/AP) Rep. Roger Williams is placed into an ambulance at the scene of a shooting at a baseball field in Alexandria, Va., June 14, 2017. This evening's baseball game will go on as scheduled. President Trump and first lady Melania Trump arrived at the hospital with flowers Wednesday evening where Trump sat by Scalise's bedside and met with his wife, Jennifer, as well as Griner and her wife. Trump tweeted, "Just left hospital. Rep. Steve Scalise, one of the truly great people, is in very tough shape - but he is a real fighter. Pray for Steve!" Trump said this morning that Scalise's condition is "much more difficult than people even thought at the time." "He's in some trouble," Trump said. "But he's a great fighter and he’s going to be OK, we hope." 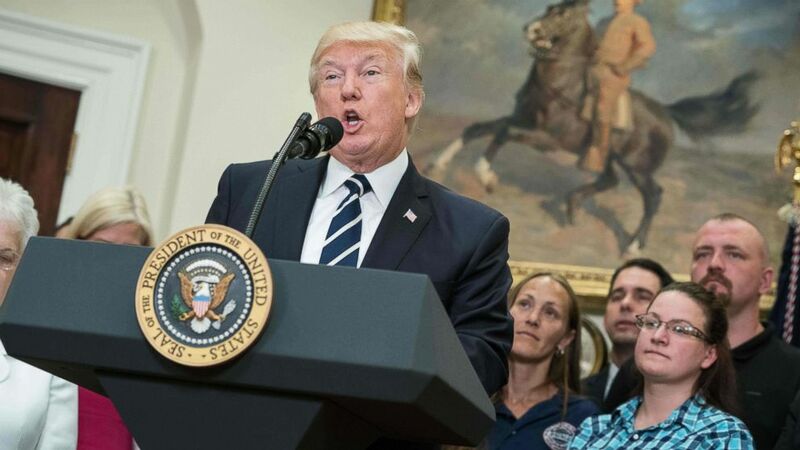 (Nicholas Kamm/AFP/Getty Images) President Donald Trump speaks during the launch of the Apprenticeship and Workforce of Tomorrow initiatives in the Roosevelt Room at the White House in Washington, D.C., June 15, 2017. The president said he assured Scalise’s family at the hospital Wednesday night that the nation is sending prayers and he applauded the heroism of Griner. “Terrific young woman," he said. "Crystal is one of the two Capitol Police officers who saved so many lives through her heroism, along with Special Agent David Bailey. They ran right into the fire. They ran right into those guns and the bullets and they saved a lot of lives. America salutes both of their courage." Trump added, “We had a very, very divided country for many years. And I have a feeling that Steve has made a great sacrifice, but there could be some unity being brought to our country. Let's hope so." Vice President Mike Pence said today, "We're especially grateful to the brave police officers who ran into danger without regard to their personal safety. ... And prevented an even greater tragedy." "While there will always be those who seek to divide, who choose insult over incite, tonight the world will see America is better than that," he said. "As President Trump said yesterday, we are strongest when we are unified. When we work together for the common good. And when a neighbor is hurting or under attack, the American people always come together. With generosity, compassion, and prayer. And we always will." House Speaker Paul Ryan said on the House floor Wednesday afternoon, "We are united in our shock. We are united in our anguish and attack on one of us is an attack on all of us." The suspected shooter, later identified as James Hodgkinson, 66, of Belleville, Illinois, was killed in a shootout with police. The immediate motive for the shooting has not been fully fleshed out, but Hodgkinson had reportedly expressed strident anti-Republican views on social media and directed particular ire at Trump after he became president. Hodgkinson was also a one-time volunteer for Bernie Sanders' campaign for president last year. Sanders on Wednesday unequivocally repudiated Hodgkinson's actions and decried his use of violence. 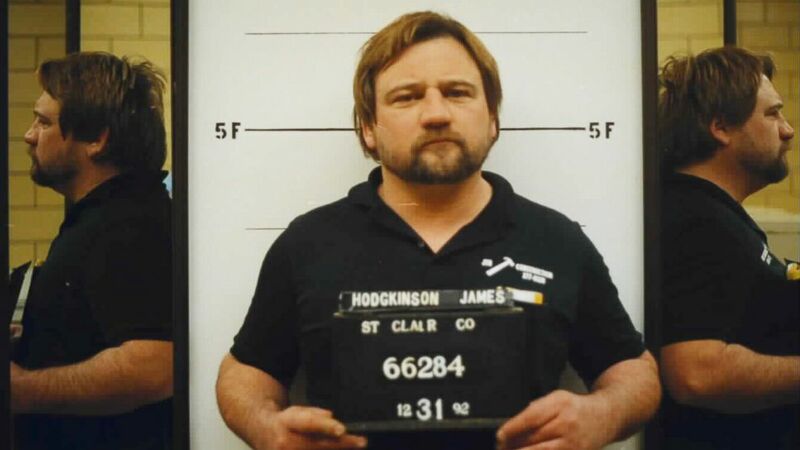 (St. Clair County Sheriff) James Hodgkins of Belleville, Ill., is pictured in a booking photo from the St. Clair County Sheriff's Department dated Dec. 31, 1992. Mark Kern, the former mayor of Belleville, Illinois, told ABC News Wednesday that Hodgkinson was fired from a county contract to remove lead from community buildings in 2003 after he was found rummaging through desks, looking for a check. Hodgkinson's wife told ABC News Wednesday that he had been living in Alexandria for the past two months, had not been working and that he was supposed to return home in the coming days. Authorities believe Hodgkinson had been in the Washington, D.C., area since March and living out of a white cargo van. 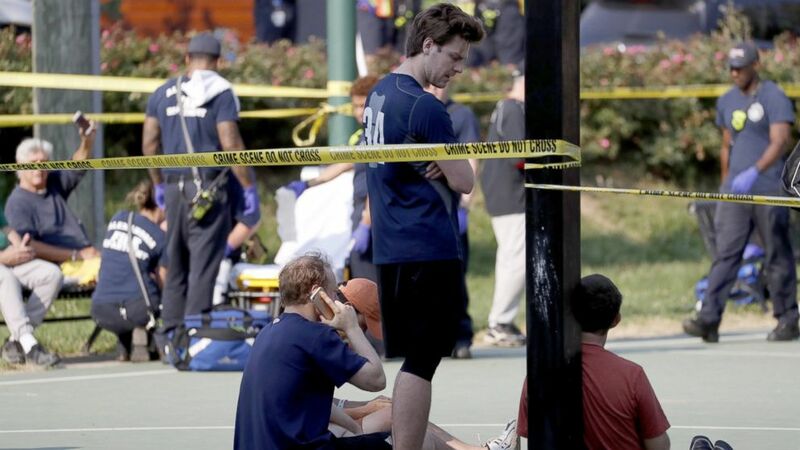 "The shooter’s weapons recovered at the scene include a 9 mm handgun and a 7.62 caliber rifle," federal authorities said today. "ATF has conducted traces on these weapons and has determined that both were purchased by the shooter from federal firearms licensees. We currently have no evidence to suggest that the purchases were not lawful." The FBI has released a "Seeking Information" poster asking the public for any information regarding the suspect as authorities investigate his "activities and social media impressions in the months leading up" to the shooting, federal officials said.